1.) To personalize your experience(your information helps us to better respond to your individual needs). 2.) To improve customer service (your information helps us to more effectively respond to your customer service requests and support needs). The email address you provide for order processing, may be used to send you status information and updates (ie, tracking shipping number) pertaining to your order. It will NOT be used to email you regarding our sales, discounts and company news/events, etc. You will need to join our email list to receive emails regarding our sales, discounts and company news/events, etc. Note: If at any time you would like to unsubscribe from receiving future emails, you may do so. There is a link at the bottom of the email to unsubscribe. All Credit Card Payments are processed through PayPal/Verisign verification*, which is an extremely secure trustworthy payment processor. PayPal uses proprietary technology - and constantly innovates - to help ensure your transactions are safe. PayPal uses powerful encryption methods and firewalls, to protect your sensitive information. Below are links for more information about PayPal. You also have the option to checkout using, Paypal orAmazon Payments Checkout - if you have an account with them. If you prefer, you can choose to have your computer warn you each time a cookie is being sent, or you can choose to turn off all cookies via your browser settings. Like most websites, if you turn your cookies off, some of our services may not function properly. However, you can still place orders over the telephone or by contacting customer service at (860)430-9909. 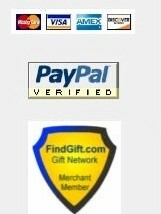 *PayPal/Verisign accepts credit cards - MasterCard, Visa, Amex or Discover. PayPal/Verisign accepts credit cards - MasterCard, Visa, Amex or Discover. Pay by phone - Call Toll Free - 1-888-880-4443 and speak to one of our friendly associates who can process your order with your credit card information. Pay by check or money order - Contact us and let us know it's on the way!